Honey is a sweet, viscous food substance produced by bees and some related insects. Bees produce honey from the sugary secretions of plants (floral nectar) or from secretions of other insects (such as honeydew), by regurgitation, enzymatic activity, and water evaporation. Bees store honey in wax structures called a honeycomb. The variety of honey produced by honey bees (the genus Apis) is the best-known, due to its worldwide commercial production and human consumption. Honey is collected from wild bee colonies, or from hives of domesticated bees, a practice known as beekeeping or apiculture. Honey gets its sweetness from the monosaccharides fructose and glucose, and has about the same relative sweetness as sucrose (granulated sugar). It has attractive chemical properties for baking and a distinctive flavor when used as a sweetener. Most microorganisms do not grow in honey, so sealed honey does not spoil, even after thousands of years. Honey provides 46 calories in a serving of one tablespoon (15 ml). Honey is regarded as safe when not taken in excessive amounts. Honey use and production have a long and varied history as an ancient activity. 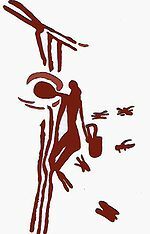 Several cave paintings in Cuevas de la Araña, Spain, depict humans foraging for honey at least 8,000 years ago. Thermal image of a honey bee (center) next to a fly (bottom) on a dandelion: The bee emits a large amount of body heat, especially where the wings attach. Honey is produced by bees collecting nectar for use as sugars consumed to support metabolism of muscle activity during foraging or to be stored as a long-term food supply. During foraging, bees access part of the nectar collected to support metabolic activity of flight muscles, with the majority of collected nectar destined for regurgitation, digestion, and storage as honey. In cold weather or when other food sources are scarce, adult and larval bees use stored honey as food. Leaving the hive, a foraging bee collects sugar-rich flower nectar, sucking it through its proboscis and placing it in its proventriculus (honey stomach or crop), which lies just dorsal to its food stomach. The honey stomach holds about 40 mg of nectar, or roughly 50% of the bee's unloaded weight, which can require over a thousand flowers and more than an hour to fill. The nectar generally begins with a water content of 70 to 80%. Salivary enzymes and proteins from the bee's hypopharyngeal gland are added to the nectar to begin breaking down the sugars, raising the water content slightly. The forager bees then return to the hive, where they regurgitate and transfer nectar to the hive bees. The hive bees then use their honey stomachs to ingest and regurgitate the nectar, forming bubbles between their mandibles, repeatedly until it is partially digested. The bubbles create a large surface area per volume and a portion of the water is removed through evaporation. Bee digestive enzymes hydrolyze sucrose to a mixture of glucose and fructose, and break down other starches and proteins, increasing the acidity. The bees work together as a group with the regurgitation and digestion for as long as 20 minutes, passing the nectar from one bee to the next, until the product reaches the honeycombs in storage quality. It is then placed in honeycomb cells and left unsealed while still high in water content (about 50 to 70%) and natural yeasts which, unchecked, would cause the sugars in the newly formed honey to ferment. Bees are some of the few insects that can generate large amounts of body heat, thus the hive bees constantly regulate the hive temperature, either heating with their bodies or cooling with water evaporation, to maintain a fairly constant temperature in the honey-storage areas around 35 °C (95 °F). The process continues as hive bees flutter their wings constantly to circulate air and evaporate water from the honey to a content around 18%, raising the sugar concentration beyond the saturation point and preventing fermentation. The bees then cap the cells with wax to seal them. As removed from the hive by a beekeeper, honey has a long shelf life and will not ferment if properly sealed. Another source of honey is from a number of wasp species, such as Brachygastra lecheguana and Brachygastra mellifica, which are found in South and Central America. These species are known to feed on nectar and produce honey. Some wasps, such as Polistes versicolor, even consume honey themselves, alternating between feeding on pollen in the middle of their lifecycles and feeding on honey, which can better provide for their energy needs. Honey is collected from wild bee colonies or from domesticated beehives. On average, a hive will produce about 65 pounds (29 kg) of honey per year. Wild bee nests are sometimes located by following a honeyguide bird. To safely collect honey from a hive, beekeepers typically pacify the bees using a bee smoker. The smoke triggers a feeding instinct (an attempt to save the resources of the hive from a possible fire), making them less aggressive and the smoke obscures the pheromones the bees use to communicate. The honeycomb is removed from the hive and the honey may be extracted from that, either by crushing or by using a honey extractor. The honey is then usually filtered to remove beeswax and other debris. Before the invention of removable frames, bee colonies were often sacrificed to conduct the harvest. The harvester would take all the available honey and replace the entire colony the next spring. Since the invention of removable frames, the principles of husbandry led most beekeepers to ensure that their bees have enough stores to survive the winter, either by leaving some honey in the beehive or by providing the colony with a honey substitute such as sugar water or crystalline sugar (often in the form of a "candyboard"). The amount of food necessary to survive the winter depends on the variety of bees and on the length and severity of local winters. Many species other than humans are attracted to wild or domestic sources of honey. Because of its composition and chemical properties, honey is suitable for long-term storage, and is easily assimilated even after long preservation. Honey, and objects immersed in honey, have been preserved for centuries. The key to preservation is limiting access to humidity. In its cured state, honey has a sufficiently high sugar content to inhibit fermentation. If exposed to moist air, its hydrophilic properties pull moisture into the honey, eventually diluting it to the point that fermentation can begin. Long shelf life of honey is attributed to an enzyme found in the stomach of bees. The bees mix glucose oxidase with expelled nectar they previously consumed, which then creates two byproducts: gluconic acid and hydrogen peroxide, partially responsible for honey's acidity and ability to suppress bacterial growth. Adulteration of honey is the addition of other sugars, syrups, or compounds into honey to change its flavor or viscosity, make it cheaper to produce, or increase the fructose content to stave off crystallization. According to the Codex Alimentarius of the United Nations, any product labeled as honey or pure honey must be a wholly natural product, although different nations have their own laws concerning labeling. Adulteration of honey is sometimes used as a method of deception when buyers are led to believe that the honey is pure. The practice was common dating back to ancient times, when honey was sometimes blended with plant syrups such as maple, birch, or sorghum and sold to unsuspecting customers. Sometimes, crystallized honey was mixed with flour or other fillers, hiding the adulteration from buyers until the honey was liquefied. In modern times, the most common adulteration ingredient became clear, almost-flavorless corn syrup, which when mixed with honey, is often very difficult to distinguish from unadulterated honey. Isotope ratio mass spectrometry can be used to detect addition of corn syrup and cane sugar by the carbon isotopic signature. Addition of sugars originating from corn or sugar cane (C4 plants, unlike the plants used by bees, and also sugar beet, which are predominantly C3 plants) skews the isotopic ratio of sugars present in honey, but does not influence the isotopic ratio of proteins. In an unadulterated honey, the carbon isotopic ratios of sugars and proteins should match. Levels as low as 7% of addition can be detected. In the United States, according to the National Honey Board (an organization supervised by the United States Department of Agriculture), "honey stipulates a pure product that does not allow for the addition of any other substance... this includes, but is not limited to, water or other sweeteners". In 2017, global production of honey was 1.9 million tonnes, led by China with 29% of the world total (table). Other major producers were Turkey, Iran, United States, and Ukraine. Over its history as a food, the main uses of honey are in cooking, baking, desserts, such as mel i mató, as a spread on bread, as an addition to various beverages, such as tea, and as a sweetener in some commercial beverages. Honey barbecue and honey mustard are other common flavors used in sauces. Possibly the world's oldest fermented beverage dating to 9,000 years ago, mead ("honey wine") is the alcoholic product made by adding yeast to the honey–water must, followed by weeks or months of fermentation. In modern mead production, the yeast Saccharomyces cerevisiae is commonly used. Primary fermentation usually takes 28 to 56 days, after which the must is placed in a secondary fermentation vessel for 6 to 9 months of aging. Durations of primary and secondary fermentation producing satisfactory mead may vary considerably according to numerous factors, such as floral origin of the honey and its natural sugar and microorganism contents, must water percentage, pH, additives used, and strain of yeast, among others. Although supplementation of the must with nitrogen, salt, or vitamins has been tested to improve mead qualities, no evidence suggests that adding nutrients reduced fermentation time or improved quality. Cell immobilization methods, however, proved effective for enhancing mead quality. Mead varieties include drinks called metheglin (with spices or herbs), melomel (with fruit juices, such as grape, specifically called pyment), hippocras (with cinnamon), and sack mead (high concentration of honey), many of which have been developed as commercial products numbering in the hundreds in the United States as of 2014. 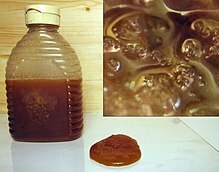 Honey is also used to make mead beer, called "braggot". Crystallized honey: The inset shows a close-up of the honey, showing the individual glucose grains in the fructose mixture. The physical properties of honey vary, depending on water content, the type of flora used to produce it (pasturage), temperature, and the proportion of the specific sugars it contains. Fresh honey is a supersaturated liquid, containing more sugar than the water can typically dissolve at ambient temperatures. At room temperature, honey is a supercooled liquid, in which the glucose will precipitate into solid granules. This forms a semisolid solution of precipitated glucose crystals in a solution of fructose and other ingredients. At the temperature of 20°C, density of honey typically ranges between 1.38 and 1.45 kg/l. The melting point of crystallized honey is between 40 and 50 °C (104 and 122 °F), depending on its composition. Below this temperature, honey can be either in a metastable state, meaning that it will not crystallize until a seed crystal is added, or, more often, it is in a "labile" state, being saturated with enough sugars to crystallize spontaneously. The rate of crystallization is affected by many factors, but the primary factor is the ratio of the main sugars: fructose to glucose. Honeys that are supersaturated with a very high percentage of glucose, such as brassica honey, crystallize almost immediately after harvesting, while honeys with a low percentage of glucose, such as chestnut or tupelo honey, do not crystallize. Some types of honey may produce very large but few crystals, while others produce many small crystals. Crystallization is also affected by water content, because a high percentage of water inhibits crystallization, as does a high dextrin content. Temperature also affects the rate of crystallization, with the fastest growth occurring between 13 and 17 °C (55 and 63 °F). Crystal nuclei (seeds) tend to form more readily if the honey is disturbed, by stirring, shaking, or agitating, rather than if left at rest. However, the nucleation of microscopic seed-crystals is greatest between 5 and 8 °C (41 and 46 °F). Therefore, larger but fewer crystals tend to form at higher temperatures, while smaller but more-numerous crystals usually form at lower temperatures. Below 5°C, the honey will not crystallize, thus the original texture and flavor can be preserved indefinitely. Since honey normally exists below its melting point, it is a supercooled liquid. At very low temperatures, honey does not freeze solid. Instead, as the temperatures become lower, the viscosity of honey increases. Like most viscous liquids, the honey becomes thick and sluggish with decreasing temperature. At −20 °C (−4 °F), honey may appear or even feel solid, but it continues to flow at very low rates. Honey has a glass transition between −42 and −51 °C (−44 and −60 °F). Below this temperature, honey enters a glassy state and becomes an amorphous solid (noncrystalline). Pouring raw honey. The sheet-like appearance of the flow is the result of high viscosity and low surface tension, contributing to the stickiness of honey. The viscosity of honey is affected greatly by both temperature and water content. The higher the water percentage, the more easily honey flows. Above its melting point, however, water has little effect on viscosity. Aside from water content, the composition of honey also has little effect on viscosity, with the exception of a few types. At 25 °C (77 °F), honey with 14% water content generally has a viscosity around 400 poise, while a honey containing 20% water has a viscosity around 20 poise. Viscosity increase due to cooling occurs very slowly at first. A honey containing 16% water, at 70 °C (158 °F), has a viscosity around 2 poise, while at 30 °C (86 °F), the viscosity is around 70 poise. As cooling progresses, honey becomes more viscous at an increasingly rapid rate, reaching 600 poise around 14 °C (57 °F). However, while honey is very viscous, it has rather low surface tension of 50--60 mJ/m2, thus the wettability of honey is on the same order as water, glycerin, or most other liquids. The high viscosity and wettability of honey lead to the phenomenon of stickiness, which is a time-dependent process in supercooled liquids between the glass-transition temperature (Tg) and the crystalline-melting temperature. Most types of honey are Newtonian liquids, but a few types have non-Newtonian viscous properties. Honeys from heather or manuka display thixotropic properties. These types of honey enter a gel-like state when motionless, but then liquify when stirred. Because honey contains electrolytes, in the form of acids and minerals, it exhibits varying degrees of electrical conductivity. Measurements of the electrical conductivity are used to determine the quality of honey in terms of ash content. The effect honey has on light is useful for determining the type and quality. Variations in its water content alter its refractive index. Water content can easily be measured with a refractometer. Typically, the refractive index for honey ranges from 1.504 at 13% water content to 1.474 at 25%. Honey also has an effect on polarized light, in that it rotates the polarization plane. The fructose gives a negative rotation, while the glucose gives a positive one. The overall rotation can be used to measure the ratio of the mixture. Honey may vary in color between pale yellow and dark brown, but other bright colors may occasionally be found, depending on the source of the sugar harvested by the bees. Honey has the ability to absorb moisture directly from the air, a phenomenon called hygroscopy. The amount of water the honey absorbs is dependent on the relative humidity of the air. Because honey contains yeast, this hygroscopic nature requires that honey be stored in sealed containers to prevent fermentation, which usually begins if the honey's water content rises much above 25%. Honey tends to absorb more water in this manner than the individual sugars allow on their own, which may be due to other ingredients it contains. Fermentation of honey usually occurs after crystallization, because without the glucose, the liquid portion of the honey primarily consists of a concentrated mixture of fructose, acids, and water, providing the yeast with enough of an increase in the water percentage for growth. Honey that is to be stored at room temperature for long periods of time is often pasteurized, to kill any yeast, by heating it above 70 °C (158 °F). Creamed honey: On the left is how it appears fresh, but the honey on the right has been aged at room temperature for two years. While still edible, the Maillard reaction produces considerable differences in the color and flavor of the aged honey. Like all sugar compounds, honey caramelizes if heated sufficiently, becoming darker in color, and eventually burns. However, honey contains fructose, which caramelizes at lower temperatures than glucose. The temperature at which caramelization begins varies, depending on the composition, but is typically between 70 and 110 °C (158 and 230 °F). Honey also contains acids, which act as catalysts for caramelization. The specific types of acids and their amounts play a primary role in determining the exact temperature. Of these acids, the amino acids, which occur in very small amounts, play an important role in the darkening of honey. The amino acids form darkened compounds called melanoidins, during a Maillard reaction. The Maillard reaction occurs slowly at room temperature, taking from a few to several months to show visible darkening, but speeds up dramatically with increasing temperatures. However, the reaction can also be slowed by storing the honey at colder temperatures. Unlike many other liquids, honey has very poor thermal conductivity of 0.5 W/(m⋅K) at 13% water content (compared to 401 W/(m⋅K) of copper), taking a long time to reach thermal equilibrium. 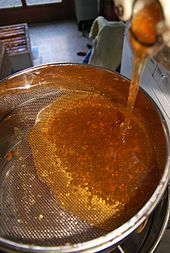 Due to its high kinematic viscosity honey does not transfer heat through momentum diffusion (convection) but rather through thermal diffusion (more like a solid), so melting crystallized honey can easily result in localized caramelization if the heat source is too hot, or if it is not evenly distributed. However, honey takes substantially longer to liquify when just above the melting point than at elevated temperatures. Melting 20 kg of crystallized honey, at 40 °C (104 °F), can take up to 24 hours, while 50 kg may take twice as long. These times can be cut nearly in half by heating at 50 °C (122 °F). However, many of the minor substances in honey can be affected greatly by heating, changing the flavor, aroma, or other properties, so heating is usually done at the lowest temperature possible for the shortest amount of time. The average pH of honey is 3.9, but can range from 3.4 to 6.1. Honey contains many kinds of acids, both organic and amino. However, the different types and their amounts vary considerably, depending on the type of honey. These acids may be aromatic or aliphatic (nonaromatic). The aliphatic acids contribute greatly to the flavor of honey by interacting with the flavors of other ingredients. Organic acids comprise most of the acids in honey, accounting for 0.17–1.17% of the mixture, with gluconic acid formed by the actions of glucose oxidase as the most prevalent. Other organic acids are minor, consisting of formic, acetic, butyric, citric, lactic, malic, pyroglutamic, propionic, valeric, capronic, palmitic, and succinic, among many others. Honey is classified by its floral source, and divisions are made according to the packaging and processing used. Also, regional honeys are identified. In the USA, honey is also graded on its color and optical density by USDA standards, graded on the Pfund scale, which ranges from 0 for "water white" honey to more than 114 for "dark amber" honey. Generally, honey is classified by the floral source of the nectar from which it was made. Honeys can be from specific types of flower nectars or can be blended after collection. The pollen in honey is traceable to floral source and therefore region of origin. The rheological and melissopalynological properties of honey can be used to identify the major plant nectar source used in its production. Most commercially available honey is blended, meaning it is a mixture of two or more honeys differing in floral source, color, flavor, density, or geographic origin. Polyfloral honey, also known as wildflower honey, is derived from the nectar of many types of flowers. The taste may vary from year to year, and the aroma and the flavor can be more or less intense, depending on which bloomings are prevalent. Monofloral honey is made primarily from the nectar of one type of flower. Monofloral honeys have distinctive flavors and colors because of differences between their principal nectar sources. To produce monofloral honey, beekeepers keep beehives in an area where the bees have access to only one type of flower. 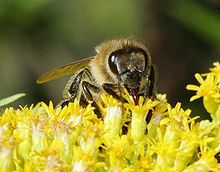 In practice, because of the difficulties in containing bees, a small proportion of any honey will be from additional nectar from other flower types. Typical examples of North American monofloral honeys are clover, orange blossom, blueberry, sage, tupelo, buckwheat, fireweed, mesquite, and sourwood. Some typical European examples include thyme, thistle, heather, acacia, dandelion, sunflower, lavender, honeysuckle, and varieties from lime and chestnut trees. In North Africa (e.g. Egypt), examples include clover, cotton, and citrus (mainly orange blossoms). The unique flora of Australia yields a number of distinctive honeys, with some of the most popular being yellow box, blue gum, ironbark, bush mallee, Tasmanian leatherwood, and macadamia. Instead of taking nectar, bees can take honeydew, the sweet secretions of aphids or other plant sap-sucking insects. Honeydew honey is very dark brown in color, with a rich fragrance of stewed fruit or fig jam, and is not as sweet as nectar honeys. Germany's Black Forest is a well-known source of honeydew-based honeys, as well as some regions in Bulgaria, Tara (mountain) in Serbia, and Northern California in the United States. In Greece, pine honey (a type of honeydew honey) constitutes 60–65% of the annual honey production. Honeydew honey is popular in some areas, but in other areas, beekeepers have difficulty selling the stronger-flavored product. The production of honeydew honey has some complications and dangers. This honey has a much larger proportion of indigestibles than light floral honeys, thus causing dysentery to the bees, resulting in the death of colonies in areas with cold winters. Good beekeeping management requires the removal of honeydew prior to winter in colder areas. Bees collecting this resource also have to be fed protein supplements, as honeydew lacks the protein-rich pollen accompaniment gathered from flowers. Generally, honey is bottled in its familiar liquid form, but it is sold in other forms, and can be subjected to a variety of processing methods. Crystallized honey occurs when some of the glucose content has spontaneously crystallized from solution as the monohydrate. It is also called "granulated honey" or "candied honey". Honey that has crystallized (or commercially purchased crystallized) can be returned to a liquid state by warming. Pasteurized honey has been heated in a pasteurization process which requires temperatures of 161 °F (72 °C) or higher. Pasteurization destroys yeast cells. It also liquefies any microcrystals in the honey, which delays the onset of visible crystallization. However, excessive heat exposure also results in product deterioration, as it increases the level of hydroxymethylfurfural (HMF) and reduces enzyme (e.g. diastase) activity. Heat also affects appearance (darkens the natural honey color), taste, and fragrance. Raw honey is as it exists in the beehive or as obtained by extraction, settling, or straining, without adding heat (although some honey that has been "minimally processed" is often labeled as raw honey). Raw honey contains some pollen and may contain small particles of wax. Strained honey has been passed through a mesh material to remove particulate material (pieces of wax, propolis, other defects) without removing pollen, minerals, or enzymes. Filtered honey of any type has been filtered to the extent that all or most of the fine particles, pollen grains, air bubbles, or other materials normally found in suspension, have been removed. 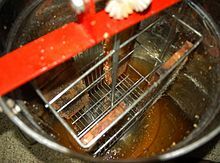 The process typically heats honey to 150–170 °F (66–77 °C) to more easily pass through the filter. Filtered honey is very clear and will not crystallize as quickly, making it preferred by the supermarket trade. Ultrasonicated honey has been processed by ultrasonication, a nonthermal processing alternative for honey. When honey is exposed to ultrasonication, most of the yeast cells are destroyed. Those cells that survive sonication generally lose their ability to grow, which reduces the rate of honey fermentation substantially. Ultrasonication also eliminates existing crystals and inhibits further crystallization in honey. Ultrasonically aided liquefaction can work at substantially lower temperatures around 95 °F (35 °C) and can reduce liquefaction time to less than 30 seconds. Creamed honey, also called whipped honey, spun honey, churned honey, honey fondant, and (in the UK) set honey, has been processed to control crystallization. Creamed honey contains a large number of small crystals, which prevent the formation of larger crystals that can occur in unprocessed honey. The processing also produces a honey with a smooth, spreadable consistency. Dried honey has the moisture extracted from liquid honey to create completely solid, nonsticky granules. This process may or may not include the use of drying and anticaking agents. Dried honey is used in baked goods, and to garnish desserts. Honey decoctions are made from honey or honey byproducts which have been dissolved in water, then reduced (usually by means of boiling). Other ingredients may then be added. (For example, abbamele has added citrus.) The resulting product may be similar to molasses. Baker's honey is outside the normal specification for honey, due to a "foreign" taste or odor, or because it has begun to ferment or has been overheated. It is generally used as an ingredient in food processing. Additional requirements exist for labeling baker's honey, including that it may not be sold labeled simply as "honey". ≥ 81.4% Good—"has a good, normal flavor and aroma for the predominant floral source or, when blended, a good flavor for the blend of floral sources and the honey is free from caramelized flavor or objectionable flavor caused by fermentation, smoke, chemicals, or other causes with the exception of the predominant floral source" Practically free—"contains practically no defects that affect the appearance or edibility of the product" Clear—"may contain air bubbles which do not materially affect the appearance of the product and may contain a trace of pollen grains or other finely divided particles of suspended material which do not affect the appearance of the product"
≥ 81.4% Reasonably good—"has a reasonably good, normal flavor and aroma for the predominant floral source or, when blended, a reasonably good flavor for the blend of floral sources and the honey is practically free from caramelized flavor and is free from objectionable flavor caused by fermentation, smoke, chemicals, or other causes with the exception of the predominant floral source" Reasonably free—"may contain defects which do not materially affect the appearance or edibility of the product" Reasonably clear—"may contain air bubbles, pollen grains, or other finely divided particles of suspended material which do not materially affect the appearance of the product"
≥ 80.0% Fairly good—"has a fairly good, normal flavor and aroma for the predominant floral source or, when blended, a fairly good flavor for the blend of floral sources and the honey is reasonably free from caramelized flavor and is free from objectionable flavor caused by fermentation, smoke, chemicals, or other causes with the exception of the predominant floral source" Fairly free—"may contain defects which do not seriously affect the appearance or edibility of the product" Fairly clear—"may contain air bubbles, pollen grains, or other finely divided particles of suspended material which do not seriously affect the appearance of the product"
Other countries may have differing standards on the grading of honey. India, for example, certifies honey grades based on additional factors, such as the Fiehe's test, and other empirical measurements. High-quality honey can be distinguished by fragrance, taste, and consistency. Ripe, freshly collected, high-quality honey at 20 °C (68 °F) should flow from a knife in a straight stream, without breaking into separate drops. After falling down, the honey should form a bead. 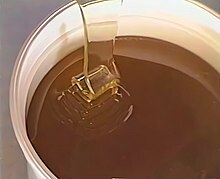 The honey, when poured, should form small, temporary layers that disappear fairly quickly, indicating high viscosity. If not, it indicates excessive water content (over 20%) of the product. Honey with excessive water content is not suitable for long-term preservation. In jars, fresh honey should appear as a pure, consistent fluid, and should not set in layers. Within a few weeks to a few months of extraction, many varieties of honey crystallize into a cream-colored solid. Some varieties of honey, including tupelo, acacia, and sage, crystallize less regularly. Honey may be heated during bottling at temperatures of 40–49 °C (104–120 °F) to delay or inhibit crystallization. Overheating is indicated by change in enzyme levels, for instance, diastase activity, which can be determined with the Schade or the Phadebas methods. A fluffy film on the surface of the honey (like a white foam), or marble-colored or white-spotted crystallization on a container's sides, is formed by air bubbles trapped during the bottling process. A 2008 Italian study determined nuclear magnetic resonance spectroscopy can be used to distinguish between different honey types, and can be used to pinpoint the area where it was produced. Researchers were able to identify differences in acacia and polyfloral honeys by the differing proportions of fructose and sucrose, as well as differing levels of aromatic amino acids phenylalanine and tyrosine. This ability allows greater ease of selecting compatible stocks. In a 100-gram serving, honey provides 304 kilocalories with no essential nutrients in significant content. Composed of 17% water and 82% carbohydrates, honey has low content of fat, dietary fiber, and protein. A mixture of sugars and other carbohydrates, honey is mainly fructose (about 38%) and glucose (about 32%), with remaining sugars including maltose, sucrose, and other complex carbohydrates. Its glycemic index ranges from 31 to 78, depending on the variety. The specific composition, color, aroma, and flavor of any batch of honey depend on the flowers foraged by bees that produced the honey. The average ratio was 56% fructose to 44% glucose, but the ratios in the individual honeys ranged from a high of 64% fructose and 36% glucose (one type of flower honey; table 3 in reference) to a low of 50% fructose and 50% glucose (a different floral source). This NMR method was not able to quantify maltose, galactose, and the other minor sugars as compared to fructose and glucose. Preliminary evidence is that honey heals partial thickness burns 4-5 days faster than conventional dressings, and moderate evidence suggests that honey heals post-operative infections faster and with fewer adverse events than antiseptic and gauze. The evidence for the use of honey in various other wound treatments is of low quality, and firm conclusions cannot be drawn. Evidence does not support the use of honey-based products in the treatment of venous stasis ulcers or ingrown toenail. Components of honey under preliminary research for their potential antibacterial properties include methylglyoxal, hydrogen peroxide, and royalisin (also called defensin-1). For chronic and acute coughs, a Cochrane review found no strong evidence for or against the use of honey. For treating children, the systematic review concluded with moderate to low evidence that honey probably helps more than no treatment, diphenhydramine, and placebo at giving relief from coughing. Honey does not appear to work better than dextromethorphan at relieving coughing in children. The UK Medicines and Healthcare Products Regulatory Agency recommends avoiding giving over the counter cough and common cold medication to children under six, and suggests "a homemade remedy containing honey and lemon is likely to be just as useful and safer to take", but warns that honey should not be given to babies because of the risk of infant botulism. The World Health Organization recommends honey as a treatment for coughs and sore throats, including for children, stating that no reason exists to believe it is less effective than a commercial remedy. Honey is recommended by one Canadian physician for children over the age of one for the treatment of coughs, as it is deemed as effective as dextromethorphan and more effective than diphenhydramine. The use of honey has been recommended as a temporary intervention for known or suspected button cell ingestions to reduce the risk and severity of injury to the esophagus caused by the battery prior to its removal. No evidence shows the benefit of using honey to treat cancer, although honey may be useful for controlling side effects of radiation therapy or chemotherapy applied in cancer treatment. Consumption is sometimes advocated as a treatment for seasonal allergies due to pollen, but scientific evidence to support the claim is inconclusive. Honey is generally considered ineffective for the treatment of allergic conjunctivitis. Although the majority of calories in honey is from fructose, honey does not cause increased weight gain and fructose by itself is not an independent factor for weight gain. Honey is generally safe when taken in typical food amounts, but it may have various, potential adverse effects or interactions in combination with excessive consumption, existing disease conditions, or drugs. Included among these are mild reactions to high intake, such as anxiety, insomnia, or hyperactivity in about 10% of children, according to one study. No symptoms of anxiety, insomnia, or hyperactivity were detected with honey consumption compared to placebo, according to another study. Honey consumption may interact adversely with existing allergies, high blood sugar levels (as in diabetes), or anticoagulants used to control bleeding, among other clinical conditions. People who have a weakened immune system may be at risk of bacterial or fungal infection from eating honey, although there is no high-quality clinical evidence that this occurs commonly. Infants can develop botulism after consuming honey contaminated with Clostridium botulinum endospores. Infantile botulism shows geographical variation. In the UK, only six cases have been reported between 1976 and 2006, yet the U.S. has much higher rates: 1.9 per 100,000 live births, 47.2% of which are in California. While the risk honey poses to infant health is small, taking the risk is not recommended until after one year of age, and then giving honey is considered safe. A honey bee collecting nectar from monkshood (Aconitum delphinifolium, or "wolf's bane"), an extremely toxic plant: The flowers are shaped in such a way that the bee must fit its entire body into the flower to reach the nectar. Mad honey intoxication is a result of eating honey containing grayanotoxins. Honey produced from flowers of rhododendrons, mountain laurels, sheep laurel, and azaleas may cause honey intoxication. Symptoms include dizziness, weakness, excessive perspiration, nausea, and vomiting. Less commonly, low blood pressure, shock, heart rhythm irregularities, and convulsions may occur, with rare cases resulting in death. Honey intoxication is more likely when using "natural" unprocessed honey and honey from farmers who may have a small number of hives. Commercial processing, with pooling of honey from numerous sources, is thought to dilute any toxins. Toxic honey may also result when bees are proximate to tutu bushes (Coriaria arborea) and the vine hopper insect (Scolypopa australis). Both are found throughout New Zealand. Bees gather honeydew produced by the vine hopper insects feeding on the tutu plant. This introduces the poison tutin into honey. Only a few areas in New Zealand (the Coromandel Peninsula, Eastern Bay of Plenty and the Marlborough Sounds) frequently produce toxic honey. Symptoms of tutin poisoning include vomiting, delirium, giddiness, increased excitability, stupor, coma, and violent convulsions. To reduce the risk of tutin poisoning, humans should not eat honey taken from feral hives in the risk areas of New Zealand. Since December 2001, New Zealand beekeepers have been required to reduce the risk of producing toxic honey by closely monitoring tutu, vine hopper, and foraging conditions within 3 km (1.9 mi) of their apiary. Intoxication is rarely dangerous. The oldest known honey remains were found in the country of Georgia. Archaeologists found honey remains on the inner surface of clay vessels unearthed in an ancient tomb, dating back some 4,700–5,500 years. In ancient Georgia, several types of honey were buried with a person for their journey into the afterlife, including linden, berry, and meadow-flower varieties. 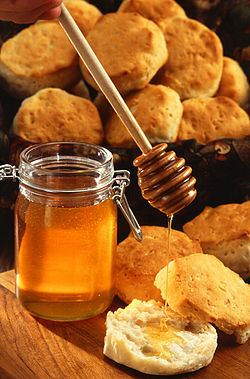 In ancient Egypt, honey was used to sweeten cakes and biscuits, and was used in many other dishes. Ancient Egyptian and Middle Eastern peoples also used honey for embalming the dead. The fertility god of Egypt, Min, was offered honey. Beekeeping in ancient China has existed since ancient times and appears to be untraceable to its origin. In the book Golden Rules of Business Success written by Fan Li (or Tao Zhu Gong) during the Spring and Autumn period, some parts mention the art of beekeeping and the importance of the quality of the wooden box for beekeeping that can affect the quality of its honey. Honey was also cultivated in ancient Mesoamerica. The Maya used honey from the stingless bee for culinary purposes, and continue to do so today. The Maya also regard the bee as sacred (see Mayan stingless bees of Central America). In myths and folk medicine, honey has been used both orally and topically to treat various aillments including gastric disturbances, ulcers, skin wounds, and skin burns by ancient Greeks and Egyptians, and in Ayurveda and traditional Chinese medicine. Proposed for treating wounds and burns, honey may have antimicrobial properties as first reported in 1892 and be useful as a safe, improvizational wound treatment. Though its supposed antimicrobial properties may be due to high osmolarity even when diluted with water, it is more effective than plain sugar water of a similar viscosity. Definitive clinical conclusions about the efficacy and safety of treating wounds, however, are not possible from this limited research. Ancient Greek Religion In ancient Greek religion, the food of Zeus and the 12 Gods of Olympus was honey in the form of nectar and ambrosia. Hinduism In Hinduism, honey (Madhu) is one of the five elixirs of life (Panchamrita). In temples, honey is poured over the deities in a ritual called Madhu abhisheka. The Vedas and other ancient literature mention the use of honey as a great medicinal and health food. Judaism In Jewish tradition, honey is a symbol for the new year, Rosh Hashanah. At the traditional meal for that holiday, apple slices are dipped in honey and eaten to bring a sweet new year. Some Rosh Hashanah greetings show honey and an apple, symbolizing the feast. In some congregations, small straws of honey are given out to usher in the new year. The Hebrew Bible contains many references to honey. In the Book of Judges, Samson found a swarm of bees and honey in the carcass of a lion (14:8). In Old Testament law, offerings were made in the temple to God. The Book of Leviticus says that "Every grain offering you bring to the Lord must be made without yeast, for you are not to burn any yeast or honey in a food offering presented to the Lord" (2:11). In the Books of Samuel, Jonathan is forced into a confrontation with his father King Saul after eating honey in violation of a rash oath Saul has made. Proverbs 16:24 in the JPS Tanakh 1917 version says "Pleasant words are as a honeycomb, Sweet to the soul, and health to the bones." Book of Exodus famously describes the Promised Land as a "land flowing with milk and honey" (33:3). However, most Biblical commentators write that the original Hebrew in the Bible (דבש devash) refers to the sweet syrup produced from the juice of dates (silan). In 2005 an apiary dating from the 10th century B.C. was found in Tel Rehov, Israel that contained 100 hives and is estimated to produce half a ton of honey annually. Pure honey is considered kosher, though it is produced by a flying insect, a non-kosher creature; other products of non-kosher animals are not kosher. Buddhism In Buddhism, honey plays an important role in the festival of Madhu Purnima, celebrated in India and Bangladesh. The day commemorates Buddha's making peace among his disciples by retreating into the wilderness. The legend has it that while he was there, a monkey brought him honey to eat. On Madhu Purnima, Buddhists remember this act by giving honey to monks. The monkey's gift is frequently depicted in Buddhist art. Christianity In the Christian New Testament, Matthew 3:4, John the Baptist is said to have lived for a long period of time in the wilderness on a diet consisting of locusts and wild honey. And thy Lord taught the Bee to build its cells in hills, on trees, and in (men's) habitations; Then to eat of all the produce (of the earth), and find with skill the spacious paths of its Lord: there issues from within their bodies a drink of varying colours, wherein is healing for men: verily in this is a Sign for those who give thought [Al-Quran 16:68–69]. ^ a b Crane E (1990). "Honey from honeybees and other insects". Ethology Ecology & Evolution. 3 (sup1): 100–105. doi:10.1080/03949370.1991.10721919. ^ a b Crane, Ethel Eva (1999). The World History of Beekeeping and Honey Hunting. Routledge. ISBN 9781136746703. ^ a b c d National Honey Board. "Carbohydrates and the Sweetness of Honey" Archived 1 July 2011 at the Wayback Machine. Last accessed 1 June 2012. ^ Oregon State University "What is the relative sweetness of different sugars and sugar substitutes?". Retrieved 1 June 2012. ^ a b Geiling, Natasha (22 August 2013). "The Science Behind Honey's Eternal Shelf Life". Smithsonian. Retrieved 28 January 2017. ^ Prescott, Lansing; Harley, John P.; Klein, Donald A. (1999). Microbiology. Boston: WCB/McGraw-Hill. ISBN 978-0-697-35439-6. ^ a b "Full Report (All Nutrients): 19296, Honey". USDA National Nutrient Database, Agricultural Research Service, Release 28. 2015. Retrieved 30 October 2015. ^ a b c d e Goldman, Ran D. (December 2014). "Honey for treatment of cough in children". Canadian Family Physician (Systematic review). 60 (12): 1107–1110. PMC 4264806. PMID 25642485. Retrieved 15 October 2015. ^ a b c d e f Binkley D (31 August 2014). "How bees make honey is complex process". The Columbus Dispatch, Columbus, Ohio, USA. Retrieved 17 November 2015. ^ Whitmyre, Val. "The Plight of the Honeybees". University of California. Archived from the original on 4 March 2007. Retrieved 14 April 2007. ^ Standifer LN. "Honey Bee Nutrition And Supplemental Feeding". Excerpted from "Beekeeping in the United States". Retrieved 14 April 2007. ^ Rossano, R; Larocca, M; Polito, T; Perna, A. M; Padula, M. C; Martelli, G; Riccio, P (2012). "What Are the Proteolytic Enzymes of Honey and What They do Tell Us? A Fingerprint Analysis by 2-D Zymography of Unifloral Honeys". PLOS ONE. 7 (11): e49164. Bibcode:2012PLoSO...749164R. doi:10.1371/journal.pone.0049164. PMC 3492327. PMID 23145107. ^ Bequaert, J.Q. (1932). "The Nearctic social wasps of the subfamily polybiinae (Hymenoptera; Vespidae)". Entomologica Americana. ^ Britto, Fábio Barros; Caetano, Flávio Henrique (2006). "Morphological Features and Occurrence of Degenerative Characteristics in the Hypopharyngeal Glands of the Paper Wasp Polistes versicolor (Olivier) (Hymenoptera: Vespidae)". Micron. 37 (8): 742–47. doi:10.1016/j.micron.2006.03.002. PMID 16632372. ^ "How honey is made". US National Honey Board. 2018. Retrieved 29 June 2018. ^ Alice L. Hopf (1979). Animals that eat nectar and honey. Holiday House Incorporated. ISBN 9780823403387. Retrieved 28 May 2016. ^ "The History of the Origin and Development of Museums". Dr. M. A. Hagen. The American naturalist, Volume 10. 1876. ^ Molan, P. C. (1996). "Authenticity of honey". Food Authentication. pp. 259–303. doi:10.1007/978-1-4613-1119-5_8. ISBN 978-1-4612-8426-0. ^ Edwards, G; Walker, D A (1983). C3, C4: Mechanisms, and Cellular and Environmental Regulation, of Photosynthesis. University of California Press. pp. 469–. GGKEY:05LA62Q2TQJ. Sucrose synthesized by a C3 plant (e.g. sugar beet) can be distinguished from sucrose synthesized by a C4 plant (e.g. sugarcane) due to differences in δ values. ^ Barry, Carla (1999). "The detection of C4 sugars in honey". Hivelights. 12 (1). Archived from the original on 17 June 2008. ^ "Website of the US National Honey Board". National Honey Board. 2018. Retrieved 22 June 2018. ^ "National Honey Board". US Department of Agriculture, Agricultural Marketing Service. 2018. Retrieved 22 June 2018. ^ "Definition of honey and honey products" (PDF). National Honey Board. 15 June 1996. Retrieved 7 January 2018. ^ a b c "Production quantity of honey (natural) in 2017, Livestock Primary/World Regions/Production Quantity from picklists". United Nations, Food and Agriculture Organization, Statistics Division (FAOSTAT). 2018. Retrieved 18 March 2019. ^ Patrick E. McGovern, Juzhong Zhang, Jigen Tang, Zhiqing Zhang, Gretchen R. Hall, Robert A. Moreau, Alberto Nuñez, Eric D. Butrym, Michael P. Richards, Chen-shan Wang, Guangsheng Cheng, Zhijun Zhao and Changsui Wang PNAS 2004 December, 101 (51) 17593-17598. "Fermented beverages of pre- and proto-historic China" http://www.pnas.org/content/101/51/17593. ^ a b c d Pereira, Ana Paula; Mendes-Ferreira, Ana; Estevinho, Leticia M.; Mendes-Faia, Arlete (2015). "Improvement of mead fermentation by honey-must supplementation" (PDF). Journal of the Institute of Brewing. 121 (3): 405. doi:10.1002/jib.239. ^ a b c d e f Iglesias, A; Pascoal, A; Choupina, A. B.; Carvalho, C. A.; Feás, X; Estevinho, L. M. (2014). "Developments in the fermentation process and quality improvement strategies for mead production". Molecules. 19 (8): 12577–90. doi:10.3390/molecules190812577. PMID 25153872. ^ a b Reuber, Brant (21 February 2015). 21st Century Homestead: Beekeeping. Lulu.com. ISBN 9781312937338. ^ a b Tierney, John (21 October 2014). "Making Mead in a Space-Age World". The Atlantic. Retrieved 20 June 2017. ^ "Braggot: The Best of Mead and Beer". American Home Brewers Association. 2017. Retrieved 19 June 2017. ^ Piotr Tomasik (20 October 2003). Chemical and Functional Properties of Food Saccharides. CRC Press. pp. 74–. ISBN 978-0-203-49572-8. ^ Value-added products from beekeeping. Food and Agriculture Organization of the United Nations. 1996. pp. 7–8. ISBN 978-92-5-103819-2. Retrieved 5 January 2016. ^ a b c d Bogdanov, Stefan (2009). "Physical Properties of Honey" (PDF). Archived from the original (PDF) on 20 September 2009. ^ "Bees 'producing M&M's coloured honey'". Telegraph.co.uk. 4 October 2012. Retrieved 30 December 2014. ^ "Thermal Conductivity of common Materials and Gases". ^ a b c d "pH and acids in honey" (PDF). National Honey Board Food Technology/Product Research Program. April 2006. Archived from the original (PDF) on 1 July 2011. Retrieved 1 March 2012. ^ Wilkins, Alistair L.; Lu, Yinrong (1995). "Extractives from New Zealand Honeys. 5. Aliphatic Dicarboxylic Acids in New Zealand Rewarewa (Knightea excelsa) Honey". J. Agric. Food Chem. 43 (12): 3021–3025. doi:10.1021/jf00060a006. ^ Value-added products from beekeeping. Chapter 2. Fao.org. Retrieved on 14 April 2011. ^ Nachel, Marty (23 June 2008). Homebrewing For Dummies. John Wiley & Sons. ISBN 9780470374160. ^ a b c "Honey Varietals". US National Honey Board and US Department of Agriculture. 2018. Retrieved 25 June 2018. The color, flavor and even aroma of honey differs, depending on the nectar of flowers visited by the bees that made it. There are more than 300 unique types of honey available in the United States alone, each originating from a different floral source. ^ "Honey Color and Flavor". National Honey Board. Retrieved 3 February 2011. Wildflower honey is often used to describe honey from miscellaneous and undefined flower sources. ^ "Varieties of honey: Polyfloral honey". The Honey Book. Retrieved 10 November 2007. Honey that is from wild or commercialized honeybees that is derived from many types of flowers is a resulting polyfloral honey. ^ a b The Colours Of Honey. Mieliditalia.it. Retrieved on 6 February 2011. ^ Reuber, Brant (21 February 2015). 21st Century Homestead: Beekeeping. Lulu.com. ISBN 9781312937338. ^ Gounari, Sofia (2006). "Studies on the phenology of Marchalina hellenica (gen.) (Hemiptera: coccoidea, margarodidae) in relation to honeydew flow". Journal of Apicultural Research. 45 (1): 8–12. doi:10.3896/IBRA.1.45.1.03. ^ Altman, Nathaniel (9 March 2010). The Honey Prescription: The Amazing Power of Honey as Medicine. Inner Traditions / Bear & Co. ISBN 9781594773464. ^ "A Short Story About A Wintering Colony With Dysentery | Bee Culture". Bee Culture. 19 April 2015. Retrieved 9 October 2018. ^ a b c Flottum, Kim (2010). The Backyard Beekeeper: An Absolute Beginner's Guide to Keeping Bees in Your Yard and Garden. Quarry Books. pp. 170–. ISBN 978-1-61673-860-0. Retrieved 5 January 2016. ^ Subramanian, R.; Hebbar, H. Umesh; Rastogi, N. K. (2007). "Processing of Honey: A Review". International Journal of Food Properties. 10: 127–143. doi:10.1080/10942910600981708. ^ "Definition of Honey and Honey Products" (PDF). honey.com - Approved by the National Honey Board. 15 June 1996. Archived from the original (PDF) on 3 December 2007. ^ Chaven, Suchart (1 November 2013). Food Safety Management: Chapter 11. Honey, Confectionery and Bakery Products. Elsevier Inc. Chapters. ISBN 9780128056509. ^ "United States Standards for Grades of Extracted Honey". USDA / Agricultural Marketing Service. Retrieved 20 January 2012. ^ a b Damerow, Gail (2011). The Backyard Homestead Guide to Raising Farm Animals: Choose the Best Breeds for Small-Space Farming, Produce Your Own Grass-Fed Meat, Gather Fresh Eggs, Collect Fresh Milk, Make Your Own Cheese, Keep Chickens, Turkeys, Ducks, Rabbits, Goats, Sheep, Pigs, Cattle, & Bees. Storey Publishing, LLC. pp. 167–. ISBN 978-1-60342-697-8. Retrieved 5 January 2016. ^ First Regional Training Workshop for Beekeepers. Bib. Orton IICA / CATIE. 1992. pp. 55–. Retrieved 5 January 2016. ^ Ultrasonic Honey Processing. Hielscher.com. Retrieved on 6 February 2011. ^ Sharma, Rajeev (2005). Improve your Health! with Honey. Diamond Pocket Books. pp. 33–. ISBN 978-81-288-0920-0. Retrieved 5 January 2016. ^ a b Krell, Rainer (1996). Value-added Products Froom Beekeeping. Food & Agriculture Org. pp. 25–. ISBN 978-92-5-103819-2. Retrieved 5 January 2016. ^ Thacker, Emily (22 April 2012). The Honey Book. James Direct, Inc. ISBN 9781623970611. ^ Honey Processing Archived 13 February 2009 at the Wayback Machine. Beeworks.com. Retrieved on 6 February 2011. ^ Honey Regulations 2003, UK Food Standards Agency. Section 2.5 (p 8), section 4.2 (pp 12-14). ^ "United States Standards for Grades of Extracted Honey" (PDF). USDA. Retrieved 8 April 2016. ^ a b Bogdanov, Stefan (2008). "Honey production" (PDF). Bee Product Science. Archived from the original (PDF) on 5 March 2009. ^ Allan, Matthew. "Basic Honey Processing". Beekeeping in a Nutshell. 5. Archived from the original on 17 February 2001. ^ "Keeping Tabs on Honey". Chemical & Engineering News. 86 (35): 43–44. 2008. doi:10.1021/cen-v086n035.p043. ^ "Beesource Beekeeping: Honey Composition and Properties". Beesource.com. October 1980. Retrieved 6 February 2011. ^ Ohmenhaeuser, Marc; Monakhova, Yulia B.; Kuballa, Thomas; Lachenmeier, Dirk W. (12 May 2013). "Qualitative and Quantitative Control of Honeys Using NMR Spectroscopy and Chemometrics". ISRN Analytical Chemistry. 2013: 1–9. doi:10.1155/2013/825318. ^ a b c Jull, Andrew B.; Cullum, Nicky; Dumville, Jo C.; Westby, Maggie J.; Deshpande, Sohan; Walker, Natalie (2015). "Honey as a topical treatment for wounds". Cochrane Database of Systematic Reviews (3): CD005083. doi:10.1002/14651858.cd005083.pub4. PMID 25742878. Honey appears to heal partial thickness burns more quickly than conventional treatment (which included polyurethane film, paraffin gauze, soframycin-impregnated gauze, sterile linen and leaving the burns exposed) and infected post-operative wounds more quickly than antiseptics and gauze. ^ Majtan, J (2014). "Honey: an immunomodulator in wound healing". Wound Repair Regen. 22 (2 Mar–Apr): 187–192. doi:10.1111/wrr.12117. PMID 24612472. ^ O'Meara S, Al-Kurdi D, Ologun Y, Ovington LG, Martyn-St James M, Richardson R (2014). "Antibiotics and antiseptics for venous leg ulcers". Cochrane Database Syst Rev (Systematic review). 1 (1): CD003557. doi:10.1002/14651858.CD003557.pub5. PMID 24408354. ^ Eekhof JA, Van Wijk B, Knuistingh Neven A, van der Wouden JC (2012). "Interventions for ingrowing toenails". Cochrane Database Syst Rev (Systematic review). 4 (4): CD001541. doi:10.1002/14651858.CD001541.pub3. hdl:1871/48564. PMID 22513901. ^ Majtan, Juraj; Klaudiny, Jaroslav; Bohova, Jana; Kohutova, Lenka; Dzurova, Maria; Sediva, Maria; Bartosova, Maria; Majtan, Viktor (1 June 2012). "Methylglyoxal-induced modifications of significant honeybee proteinous components in manuka honey: Possible therapeutic implications". Fitoterapia. 83 (4): 671–677. doi:10.1016/j.fitote.2012.02.002. PMID 22366273. ^ Kwakman, P. H; Zaat, S. A (2012). "Antibacterial components of honey". IUBMB Life. 64 (1): 48–55. doi:10.1002/iub.578. PMID 22095907. ^ Mulholland S, Chang AB (2009). "Honey and lozenges for children with non-specific cough" (PDF). Cochrane Database Syst Rev (Systematic review) (2): CD007523. doi:10.1002/14651858.CD007523.pub2. PMID 19370690. ^ a b c Oduwole, Olabisi; Udoh, Ekong E.; Oyo-Ita, Angela; Meremikwu, Martin M. (2018). "Honey for acute cough in children". The Cochrane Database of Systematic Reviews. 4: CD007094. doi:10.1002/14651858.CD007094.pub5. ISSN 1469-493X. PMID 29633783. ^ "Cough". NHS Choices. 20 June 2013. Retrieved 18 June 2014. ^ "Cough and cold remedies for the treatment of acute respiratory infections in young children". World Health Organization. Retrieved 15 October 2015. ^ "Button Battery Ingestion: Triage and Treatment Guideline". National Capital Poison Center, Washington, DC. June 2018. Retrieved 5 July 2018. ^ Anfang, Rachel R.; Jatana, Kris R.; Linn, Rebecca L.; Rhoades, Keith; Fry, Jared; Jacobs, Ian N. (11 June 2018). "pH-neutralizing esophageal irrigations as a novel mitigation strategy for button battery injury". The Laryngoscope. doi:10.1002/lary.27312. ISSN 0023-852X. PMID 29889306. ^ a b c d e f g "Honey". Mayo Clinic. 1 November 2013. Retrieved 24 September 2015. ^ Dale Kiefer (4 May 2012). "Honey for Allergies". ^ Rudmik L, Hoy M, Schlosser RJ, Harvey RJ, Welch KC, Lund V, Smith TL (April 2013). "Topical therapies in the management of chronic rhinosinusitis: an evidence-based review with recommendations". Int Forum Allergy Rhinol (Review). 3 (4): 281–98. doi:10.1002/alr.21096. PMID 23044832. ^ Bogdanov, S; Jurendic, T; Sieber, R; Gallmann, P (2008). "Honey for nutrition and health: A review". Journal of the American College of Nutrition. 27 (6): 677–89. doi:10.1080/07315724.2008.10719745. PMID 19155427. ^ Sievenpiper JL, de Souza RJ, Mirrahimi A, Yu ME, Carleton AJ, Beyene J, Chiavaroli L, Di Buono M, Jenkins AL, Leiter LA, Wolever TM, Kendall CW, Jenkins DJ (2012). "Effect of Fructose on Body Weight in Controlled Feeding Trials: A Systematic Review and Meta-analysis". Ann Intern Med. 156 (4): 291–304. doi:10.7326/0003-4819-156-4-201202210-00007. PMID 22351714. ^ "The National Honey Board: Frequently Asked Questions". Honey.com. Archived from the original on 1 February 2010. Retrieved 6 February 2011. ^ "Report on Minimally Processed Infant Weaning Foods and the Risk of Infant Botulism" (PDF). Advisory Committee on the Microbiological Safety of Food. July 2006. Archived from the original (PDF) on 19 October 2010. Retrieved 9 January 2012. ^ Infant Botulism and Honey. Edis.ifas.ufl.edu. Retrieved on 9 January 2012. ^ a b Jansen, Suze A.; Kleerekooper, Iris; Hofman, Zonne L. M.; Kappen, Isabelle F. P. M.; Stary-Weinzinger, Anna; van der Heyden, Marcel A. G. (2012). "Grayanotoxin Poisoning: 'Mad Honey Disease' and Beyond". Cardiovascular Toxicology. 12 (3): 208–215. doi:10.1007/s12012-012-9162-2. PMC 3404272. PMID 22528814. ^ "Grayanotoxin" at the Wayback Machine (archived 14 March 2010) in the Foodborne Pathogenic Microorganisms and Natural Toxins Handbook, FDA Center for Food Safety and Applied Nutrition. ^ "Tutu toxicity: three case reports of Coriaria arborea ingestion, review of literature and recommendations for management - New Zealand Medical Journal". www.nzma.org.nz. Retrieved 9 October 2018. ^ Isack HA, Reyer HU (1989). "Honeyguides and honey gatherers: interspecific communication in a symbiotic relationship". Science. 243 (4896): 1343–6. Bibcode:1989Sci...243.1343I. doi:10.1126/science.243.4896.1343. PMID 17808267. ^ Short, Lester, Horne, Jennifer and Diamond, A. W. (2003). "Honeyguides". In Christopher Perrins (Ed.). Firefly Encyclopedia of Birds. Firefly Books. pp. 396–397. ISBN 1-55297-777-3. ^ Dean, W. R. J.; MacDonald, I. A. W. (1981). "A Review of African Birds Feeding in Association with Mammals". Ostrich. 52 (3): 135–155. doi:10.1080/00306525.1981.9633599. ^ Kvavadze, Eliso; Gambashidze, Irina; Mindiashvili, Giorgi; Gogochuri, Giorgi (2006). "The first find in southern Georgia of fossil honey from the Bronze Age, based on palynological data". Vegetation History and Archaeobotany. 16 (5): 399–404. doi:10.1007/s00334-006-0067-5. ^ Georgian ancient honey Archived 4 July 2012 at the Wayback Machine. cncworld.tv (31 March 2012). Retrieved on 10 July 2012. ^ Report: Georgia Unearths the World’s Oldest Honey. EurasiaNet (30 March 2012). Retrieved on 3 July 2015. ^ The world's first winemakers were the world's first beekeepers. guildofscientifictroubadours.com (2 April 2012). Retrieved on 10 July 2012. ^ Plutarch. Life of Solon. p. 23. ^ a b Bresson, Alain (3 November 2015). The Making of the Ancient Greek Economy: Institutions, Markets and Growth. Princeton University Press. ISBN 9781400852451. Retrieved 16 December 2015. ^ a b c Maddocks, Sarah E; Jenkins, Rowena E (2013). "Honey: a sweet solution to the growing problem of antimicrobial resistance?". Future Microbiology. 8 (11): 1419–1429. doi:10.2217/fmb.13.105. PMID 24199801. ^ a b Stewart, JA; McGrane, OL; Wedmore, IS (2014). "Wound care in the wilderness: is there evidence for honey?". Wilderness Environ Med. 25 (1 (Mar)): 103–110. doi:10.1016/j.wem.2013.08.006. PMID 24393701. ^ Henrichs, Albert (1 April 1980). Harvard Studies in Classical Philology. Harvard University Press. ISBN 9780674379305. ^ Michalski, Henry; Mendelsohn, Donna; Valley, Jewish Historical Society of Napa (1 January 2012). Napa Valley's Jewish Heritage. Arcadia Publishing. ISBN 9780738588988. ^ Berel, Rabbi. (24 September 2005) Apples and Honey. Aish.com. Retrieved on 6 February 2011. ^ Mazar, Amihai; Panitz-Cohen, Nava (2007). "It Is the Land of Honey: beekeeping at Tel Rehov". Near Eastern Archaeology. 70 (4): 202–219. ^ The Hebrew University of Jerusalem. "First Beehives In Ancient Near East Discovered". ScienceDaily. ScienceDaily. Retrieved 6 October 2015. ^ "Why is honey kosher?" Chabad.org. Retrieved 30 November 2010. ^ Sahih Bukhari vol. 7, book 71, number 584, 585, 588 and 603. Krell, R. (1996). Value-added products from beekeeping. Food and Agriculture Organization of the United Nations. ISBN 978-92-5-103819-2. Retrieved 5 January 2016. Root, A. I.; Root, E. R. (2005). The ABC and Xyz of Bee Culture. Kessinger Publishing. ISBN 978-1-4179-2427-1. Retrieved 5 January 2016. "Honey" . The New Student's Reference Work . 1914.